By taking a one-two victory in Austin, Texas, USA, the Porsche LMP Team further extended its world championship lead. 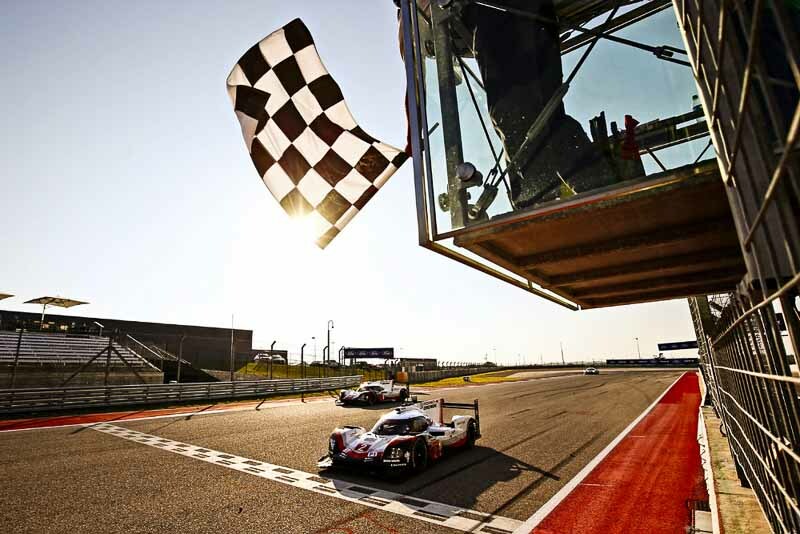 Earl Bamber (NZ), Timo Bernhard (DE) and Brendon Hartley (NZ), the championship leading Le Mans winners, crossed the line first at the Circuit of The Americas. The sixth round of the FIA World Endurance Championship (WEC) was a hot six-hour race with up to 33 degree Celsius ambient temperature and 40 degree Celsius track temperatures. The reigning world champion Neel Jani (CH), André Lotterer (DE) and Nick Tandy (GB) finished second. This trio had started from pole position and led for most of the race before letting the sister car ahead in the closing stages which is better placed in the championship. Jani achieved the fastest race lap in 1:47.149 minutes on lap 9 of 192. Toyota’s prototypes were strong opponents. The result marked the Porsche 919 Hybrid’s 17th race win and the seventh one-two victory since its debut in 2014. Furthermore, it now has eleven fastest race laps to its tally. Porsche aims to complete the innovative prototype’s career in a perfect manner in its final season this year. Having won the Le Mans 24-Hours three years in a row, the team is aiming to achieve a third consecutive world championship title for manufacturers and drivers. Porsche has now scored 242 points in the manufacturers’ world championship with Toyota on 168.5 points. In the drivers’ rankings, Bamber/Bernhard/Hartley (159 points) have extended their lead over the best placed Toyota drivers (108 points). Jani/Lotterer/Tandy lie fourth in the championship (90 points). Due to the excessive heat, the maximum consecutive time for a driver at the wheel was limited to 80 minutes from the regulations. This made it clear before the start that no double stints would be possible. The 919 Hybrid could do 30 laps with one fuel fill which lasted approximately 57 minutes. The seventh of nine WEC rounds will take place on October 15 in Fuji, Japan.